More poppies, but taken at a different time of the day. 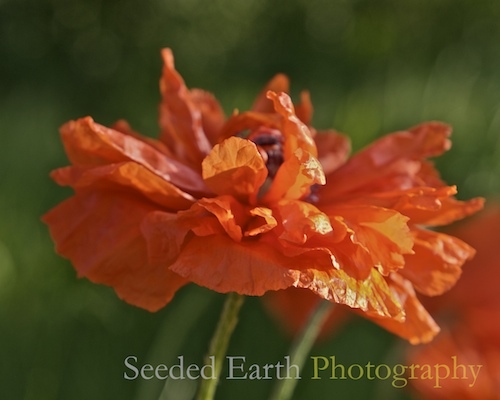 These poppies were photographed in the early morning light, and they took on a shimmering, papery translucency. I don’t usually wear skirts (more the jeans & t-shirt type), but I’d gladly wear one that looked as pretty as a poppy. I’m in jeans/tees all the time too. Imagine if we both stepped out in orange fluttery skirts!! Very well done! The light creates gorgeous highlights in the petals. They almost look like crepe paper. Such wonderful detail and color. This image cries to be printed large and on canvas! Give it a try! Beautiful flower and enjoyable commentary. If I were to step out in an orange skirt, I’d need to call it a kilt (and that would be one wild kilt).